The October 2017 issue of Tabletalk will consider the history and impact of the Protestant Reformation, looking back to our heritage but also discussing how it should shape the next five hundred years of church history (should the Lord tarry). Five hundred years ago, various historical and theological movements converged on the European Continent, resulting in the greatest movement of God since the days of the Apostles. 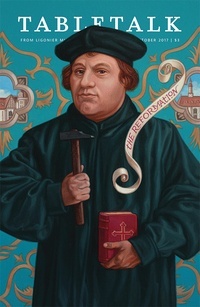 By recovering the gospel, the final authority of Scripture, the centrality of Christ, and the priesthood of all believers, the Protestant Reformers brought renewal that transformed the Western church and has shaped the course of history ever since. Yet, the work of reforming the church did not end with the Reformers, but it continues now and until the return of Christ. This issue will provide an overview of the Reformation and look at what it means to continue reforming the church according to Scripture in the years to come. Contributors include R.C. Sproul along with Michael Reeves, Stephen J. Nichols, Guy Prentiss Waters, Ryan Reeves, Rebecca VanDoodewaard, and W. Robert Godfrey.